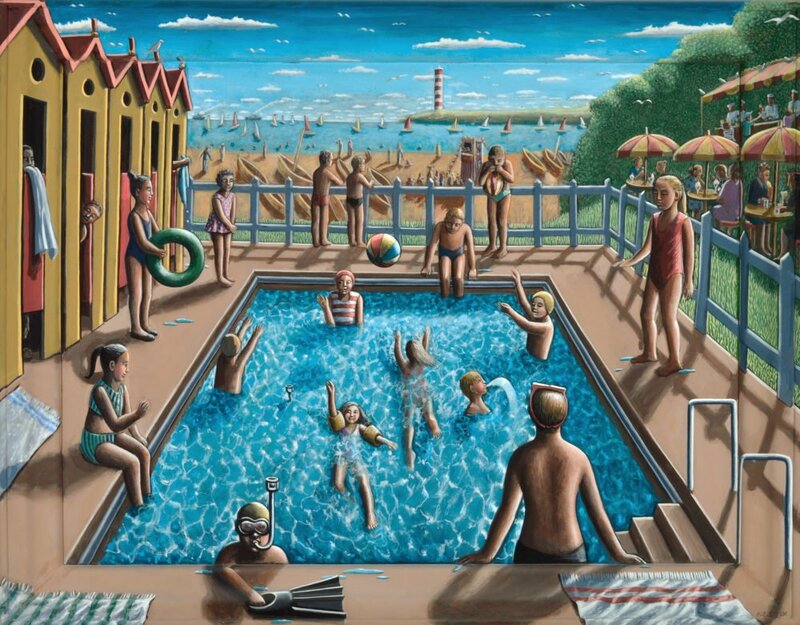 This June we welcome PJ Crook for her solo exhibition; Immortals, Men and Beasts. The Cheltenham born artist and sculptor, will be showcasing her work at our Trinity House Paintings Broadway Gallery, from 21st June – 16th July. The exhibition will include paintings in her renowned style, beautifully depicting grotesque crowds, as well as assemblages that magnificently overspill their frames. Over the course of her career, PJ’s paintings have been showcased worldwide, in countries as diverse as Japan, Saudi Arabia, Canada and Estonia, giving her an international reputation and following. Back home in her Cotswold surroundings, she likes to get involved in many community projects, often giving back to the community that has fed her inspiration over the years. She hopes to inspire the next generation of artists, generously donating a number of pieces of art to the new art campus of the University of Gloucestershire, with which she has a close relationship. PJ attended the institution, formerly known as Gloucestershire college of Art and Design, at the start of her career, and was even awarded an honorary doctorate of art in 2010. Although PJ is no stranger to awards, and in 2011 was appointed an MBE for her services to art. PJ Crook, at home in her cotswold studio. It’s hard not to feel inspired by the honey-coloured stone villages and the idyllic rolling hills of the cotswolds. So its no surprise PJ has chose to call it home for all these years. Her favourite view is that from Cleve Hill, looking down over the racecourse as far as the Malverns. However, to PJ a crowd is also a ‘view’, so she would often visit the Cheltenham Festival, where she would observe the bustling crowds and find inspiration for her next painting. In her own words, PJ describes her work as figurative, narrative and mainly concerned with the human condition; often the relationship between two or three figures and the interior in which they exist; layered with time, although seemingly held at one moment. ‘The Supper’ depicts exactly that. Although fixed, interactions portrayed between the crowds allows the imagination to truly bring the painting to life. Although it is PJ’s artistic skill that brings her work to life even further. She works with depth of field in such a way that manipulates perception. The elevated viewpoint in ‘The Supper’ brings everything forward to the front of the canvas, making it hard to tell the distance between characters, yet somehow intensifying the ambience in the scene. PJ’s paintings almost always continue over and around the frames, and is an integral part of the work as it represents her attempt to entice the viewer into the painting and the stories therein. PJ explored this further by creating assemblages which offer a fiercely different impact from her paintings. It is only on closer inspection, that it is recognisable they carry PJ’s unique style. In ‘Stepping Out (in my shoes) the delicate frame both contains the chaotic scene as well as being the platform for more art to burst from the boundary at all angles. However, this piece of work by PJ is also a autobiographical account of her career. The artist explained how she had always hoarded shoes over her lifetime, like many women do, and upon noticing a worn down pair of canvas mules, she saw something very sculptural about them. It was this that influenced the central panel of the painting. 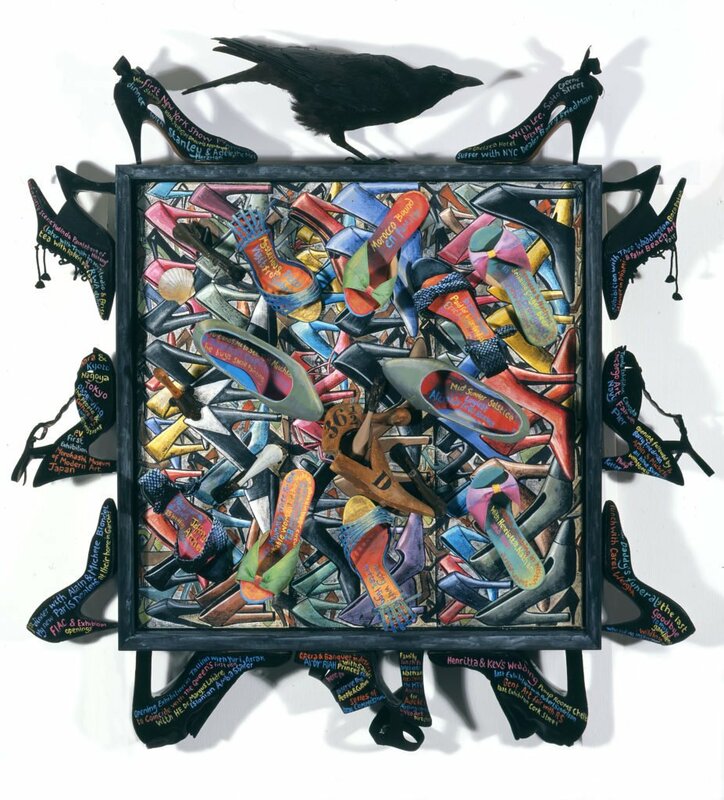 PJ then decided she would attach more treasured shoes that she have worn at other times through her painting career, then add details of the places she had worn all the shoes and what had been happening in her life at those times. For instance her first New York opening, her first Paris exhibition; the Chicago Art Fair; meeting with Robert Fripp and Toyah etc. And although covering a thirty year period, amusingly all happen to be in black suede. The exhibition will be open from Friday 22nd June – Sunday 15th July. For more information on the exhibition or the artwork on show, please contact Noah Warren.